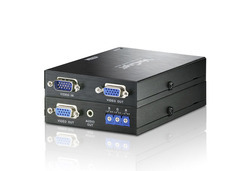 VGA Extender | Simply Connect Pte Ltd. The VE156T VGA Over Cat 5 Transmitter Wall Plate connects to a VE156R to extend VGA signals up to 150m from the source using Cat 5e cables.It supports popular wide screen formats and ensures excellent video quality over long distance transmissions. 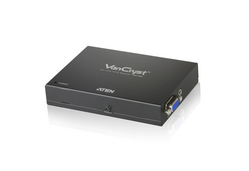 The VB100 VGA Booster amplifies the VGA signal from a source device and transmits it to a display up to 70 meters away. The VGA booster extends the display distance without any signal loss; to bring you a crystal clear video display at a longer distance. VE150A video extender comprises a local transmitting unit and a remote receiving unit which are connected by standard Cat 5e cables. The VE150AR video receiver connects to a VE150AT to extend signals up to 150m from the source using a Cat 5e cable. It is ideal for factories and construction sites, or any location where the display may need to expose in a risky setting, but you want the system to be kept in a safe location. The VE300 A/V Over Cat 5 Extender is exclusively designed to integrate seamlessly with the ATEN VM0808T/VM1616T Matrix Switch. The VE300T A/V Over Cat 5 Transmitter is exclusively designed to integrate seamlessly with the ATEN VM0808T/VM1616T Matrix Switch to extend signals up to 300m from the source to the switch using Cat 5e cables. 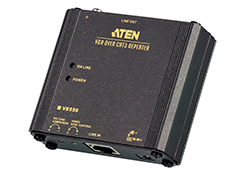 The VE300R A/V Over Cat 5 Receiver is exclusively designed to integrate seamlessly with the ATEN VM0808T/VM1616T Matrix Switch to extend signals up to 300m from the switch to a display using Cat 5e cables. The VE300RQ A/V Over Cat 5 Receiver is exclusively designed to integrate seamlessly with the ATEN VM0808T/VM1616T Matrix Switch to extend signals up to 300m from the switch to a display using Cat 5e cables. The VE022 Mini Cat 5 A/V Extender allows you to extend the distance between your video/audio source and display devices by as much as 150 meters, using a Cat 5e cable, providing an easy way to replace heavy and expensive VGA cables. he VE022R Mini Cat 5 A/V Receiver connects with a VE022T to extend signals up to 150m from the source using a Cat 5e cable. With hot-plugging support, you can quickly add or remove the VE022R receiver connected to the display device without having to power down any of the devices. The VE170 A/V Over Cat 5 Extender, comprising of a VE170T Transmitter unit and a VE170R or VE170RQ Receiver unit, is a cost-effective and effi cient solution for sending and receiving high quality audio and video content. 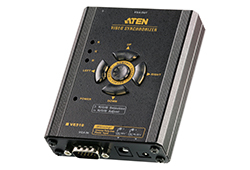 The VE170Q package consists of a transmitter (VE170T) and receiver (VE170RQ), which includes ATEN’s patented Deskew™ technology that supports resolutions up to 1280 x 1024 @ 300 m, and features manual synchronization of the RGB signals and correction of color phase and timing errors that occur over long distances. The VE500 A/V Over Cat 5 Extender is exclusively designed to integrate seamlessly with the ATEN VM0808T/VM1616T Matrix Switch. The VE500T A/V Over Cat 5 Transmitter is exclusively designed to integrate seamlessly with the ATEN VM0808T/VM1616T Matrix Switch to extend signals up to 300m from the source to the switch using Cat 5e cables. The VE500R A/V Over Cat 5 Receiver is exclusively designed to integrate seamlessly with the ATEN VM0808T/VM1616T Matrix Switch to extend signals up to 300m from the switch to a display using Cat 5e cables. 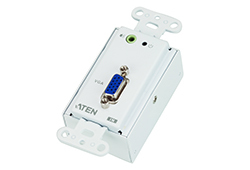 The VB552 VGA Over Cat 5 Repeater +Audio is an audio/video signal extension device which is compatible with ATEN Cat 5 Audio/Video splitters. The VB552 extends the audio/video transmission range an extra 150m over Cat 5e (or higher) cables. The VE510 Video Synchronizer is designed to compensate for video signal delays over large distances. The VE510's line synchronizing function corrects color phase and timing errors that occur over long distance transmissions. 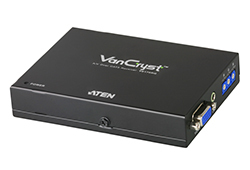 The VE550 VGA Over Cat 5 Repeater is a video signal extension device which is compatible with ATEN KVM Extenders, Video Extenders, and Cat 5 KVM Switches. The VE550 extends the video transmission range up to twice the original distance over Cat 5e cables.